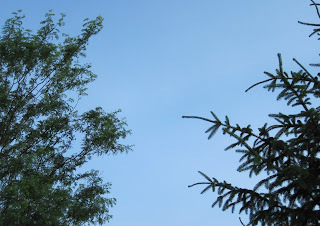 Discovering the Garden Design Element of "Placeness"
Or see up close the plants around me. This place was always here, waiting to be discovered. Like a diamond cutter studies the rough, unimpressive rock before making the first cut and revealing the beauty of the diamond within, my garden designer studied my back yard before she laid out the garden beds and in the process revealed this special place to sit and rest. Here I can sit in the evenings with the setting sun behind me and reflect on the events of the day and make decisions about tomorrow. 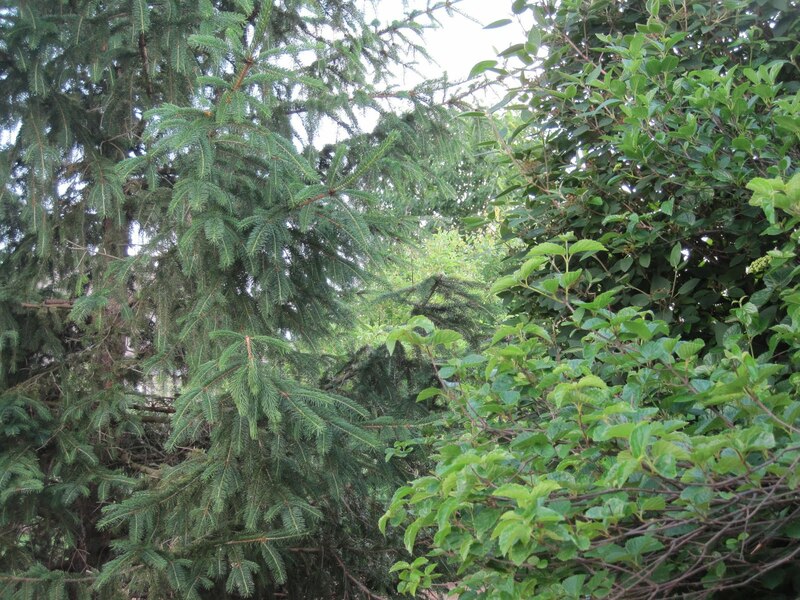 There are shrubs behind me and a spruce close by, making me feel like I am truly in the garden, hidden from view. Yet from here I can view most of the rest of the garden. This special place was always here, revealed by the garden designer's design. I don't think I would have ever found it on my own. 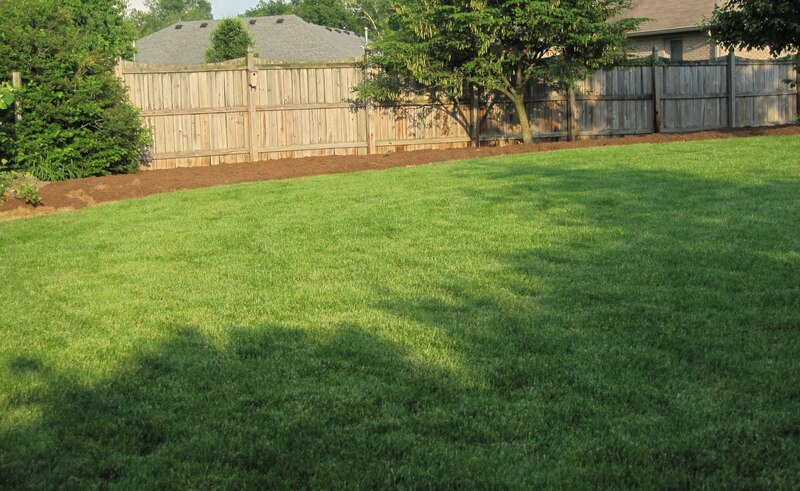 It truly does reflect the garden design element of “placeness” in my garden and confirms again my decision to work with a garden designer, someone who can see the beauty of a garden in the plain-ness of my yard. sometimes we need a pair of fresh eyes to see what's right in front of our noses. A lovely post, Carol. So glad the design is working out and that you are feeling comfortable. I found this spot in my garden, and I put a bench on it, too. Even if your garden is small, there's always room to still explore. I call my place the Gardener's Nook. It's in my backyard native plant garden. It's notched into the corner of two adjoining borders, so it's surrounded on three sides by native shrubs and wildflowers. It's positioned to look out over the garden, while still providing screened views to the sides of the house, for when visitors are expected. It's populated by two kit-built Adirondack chairs, to encourage lingering and sharing the moments of the day. Coral it's a delight surprise to wake up one day and discovery something new and pleasurable that the eye and mind didn't recognize before, but was there all along! What a wonderful unfolding treat you are having redesigning your yard, everything is looking wonderful! Yes, that special place needs to offer both protection and good views. It's a trick to provide both. Most of my seating areas provide one without the other. Even if one doesn't get a designer to come into the garden it is fun to see your garden through anothers eyes. I like to hear what people say. Even the negative remarks can hold an insight to your garden. A very calm and soothing post. Great words. It always surprises me how many different "ways of looking" there are - especially when it comes to a garden. What to one gardener may look like a restful place to relax may, to another person, look like the perfect spot for a vegetable bed, or a swing set, a pond, a garden shed, the Peony Garden, ... It's so important to work with a designer who understands how you see things but who can also see beyond that, with her own vision. Please keep posting photos! A couple of weeks ago I found such a spot in my garden. It was a place where we usually put the branches the wind knocks to the ground in winter. 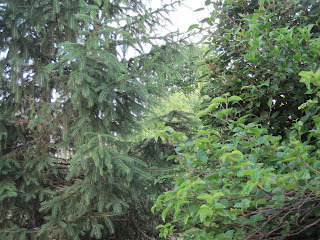 I was there cutting up the branches, and realized that this would be a nice shady place to sit in the summer. I dragged a glider ($5 at a garage sale)down there. Set up some big planters to shield me on the one open side. Introduced a couple of garden ornaments my husband won't let me place more prominently, and VOILA! And to think it was there all along.